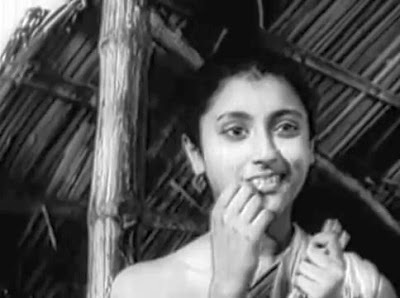 Teen Kanya (Three Girls or Three Daughters, 1961) is a three-part anthology film by Satyajit Ray based on three early short stories of Rabindranath Tagore (1861-1941) – “The Postmaster” (1891), “Monihara” (“The Lost Jewels”, 1898), and “Samapti” (“The Conclusion”, 1893). Tagore was a towering Bengali cultural figure and Nobel Laureate who also had been a friend of Ray’s distinguished family. 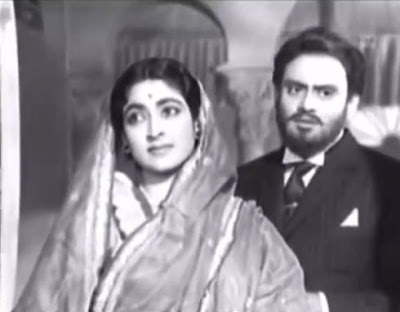 Both Teen Kanya and Ray’s subsequent film, the documentary Rabindranath Tagore (1961), commemorated the centenary of Tagore’s birth. Because of the length of the collected segments, the film was released internationally without the second of the three stories, “Monihara”, included, and its English title was Two Daughters . So most English-speaking viewers have only seen this truncated version. In this review, however, I will refer to all three segments. Given the monumental esteem in which Tagore was held in India, it took great self-assurance on the part of any filmmaker to modify Tagore’s stories when using them as a basis for making a film. However, Ray’s embellishments to Tagore’s stories in Teen Kanya, which were considerable with respect to “The Postmaster” and “Samapti” and which were criticized in India at the time, offered, in my view, significant enhancements . Ray could do this, because he, like Tagore, was himself an artistic polymath. He not only wrote, directed, and produced the film; here he also for the first time scored the film music. Earlier Ray had relied on famous Indian musician-composers for his musical scores – Ravi Shankar (for the Apu Trilogy  and Paras Pathar), Ustad Vilayat Khan (for Jalsaghar), and Ali Akbar Khan (for Devi). Ray, himself, had no formal musical training and was not a musician, but he had an intense and lifelong intuitive passion for music. And Teen Kanya marked the opening assertion of his musical prowess. From here on, except for the documentary Rabindranath Tagore, Ray would score all of his films. Note that, in general, sound is a very important feature of Ray’s films. The ambient sounds included in these stories significantly helps create an atmosphere of contextual immersion and evokes the narrative mood of the participants in the tales. 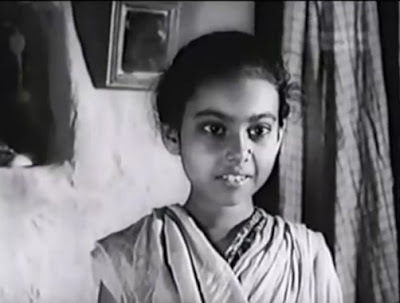 Teen Kanya also marked another new feature in the Ray production team repertoire with the introduction of cinematographer Soumendu Roy, who took over for the ailing Subrata Mitra. And in fact it is probably no coincidence that a notable feature of Teen Kanya’s visual presentation is its excellent use of deep-focus cinematography. Hereafter, Roy would frequently be the cinematographer for Ray’s films. A constant element of Ray’s production team, though, was Dulal Dutta, who handled the film editing duties for all of Ray’s films. Even though the three individual stories of Teen Kanya each focus on a young woman, they appear to have contrasting flavors and themes, and to many people they may seem quite distinct. I would say, in retrospect however, that they do feature a common thread – the eternal inscrutability of womanhood before the male gaze. All three stories feature a young girl whose personal scope vastly exceeds the conventional roles to which she has been assigned. And in each case there is a narrative perspective from a male observer (in alignment with the unseen narrative witness of you, the viewer) who is baffled and ultimately bewitched by the girl. Let us look at these stories individually. In the first story Nandal (played by Anil Chatterjee), an educated young man from Calcutta, arrives in the small rural village of Ulapur to take on the job as the local postmaster. The pre-teen orphan girl Ratan (Chandana Banerjee ) is assigned to be his cook and housekeeper. From the outset it is clear there is a disconnect between Nandal and the life in the village. This is exemplified by Nandal’s terror at the sight of a village lunatic, whom the diminutive Ratan shoos away as just a harmless pest. At his postoffice, Nandal’s everyday work includes constant spectators – the idle old men of the village who are fascinated by the exotic newcomer. But again the disconnect is evident. Meanwhile Nandal and Ratan get to know each other a little. She sings a charming song for him, and he offers to spend some of his idle time teaching her a little how to read and write. But finally Nandal comes down with a serious case of malaria (a common ailment in India in those days). In response, Ratan devotedly spends the whole night applying cold compresses to his feverish forehead, and she dedicates herself to nursing him back to health. Throughout this period of the story, we get the feeling that Ratan sees Nandal as the wished-for replacement of her father, who died so early in her life that she can’t even remember him. Nandal recovers and writes a simple poem about Ratan, one that she is now able to read aloud. She is so delighted. But Nandal is fed up with the boring village and decides to resign from his post and go back to Calcutta. The news of his impending departure crushes Ratan, and she petulantly refuses even to acknowledge him when he approaches her for the last time to say goodbye. It is only then that Nandal seems to realize that he and Ratan shared a special relationship – a form of love – that he has abandoned and is now lost. 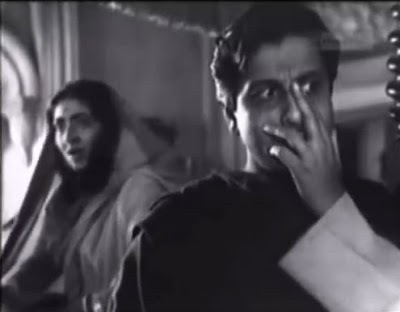 It is that poignant last shot showing Nandal’s final anguish that long lingers in the mind of the viewer. One can get a feeling for how Ray enhanced Tagore’s work by having a read of Tagore’s original story [5,6]. The local color of the village, such as the depictions of the lunatic and the village elders are not present in Tagore’s text. 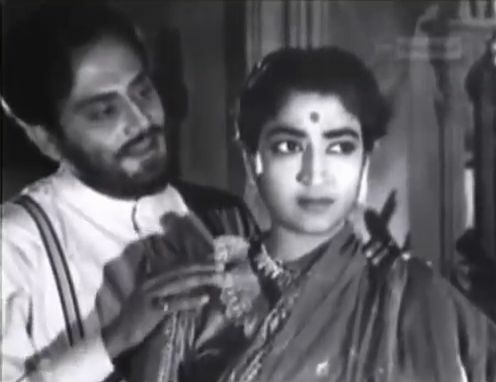 In addition the tentative, growing relationship between Nandal and Ratan is much more developed in Ray’s film than in Tagore’s dry description. Tagore’s story, while interesting, is basically reflective and contemplative. Ray’s rendition fleshes out the characters of Nandal and Ratan, and it captures the emotive feelings that more effectively stir the heart. The second segment is a dramatized ghost story that is read to the viewer by its supposed author on the footsteps of a ghat in front of the thought-to-be haunted Saha mansion. The narrator, who is a local schoolmaster, has an audience of one – a hooded figure sitting at the base of the ghat. The ghost story itself is rather simple. 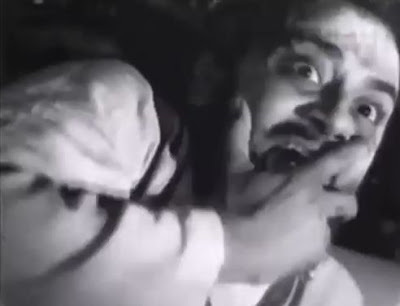 What makes it interesting is the atmospheric way it is told, featuring Soumendu Roy’s expressionistic cinematography. At the start of the narrator’s story, which he says begins many years ago, Phanibhushan Saha (Kali Banerjee) and his wife Monimalika (Kanika Majumdar) have just inherited a large mansion and associated jute plantation in Manikpur. Phanibhushan is hopelessly and timidly in love with his wife, who is self-indulgently obsessed with her own glamor. One day while her husband is out, Monimalika is visited by an obscure “relative”, Madhusudhan (Kumar Roy), who refers to himself as her distant “brother” and who has come looking for a job. 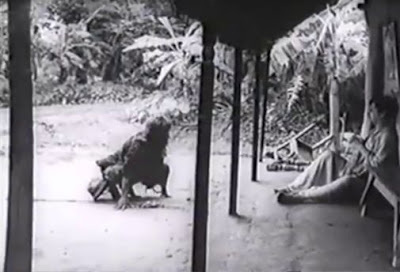 It is clear from the photography and eerie music of this scene that there is something sinister about this visitor. He apparently has some shady connections with Monimalika‘s cloudy past, and she wants to have no part of him. Afterwards she sings alone by the window a beautifully melancholic song that shows off her mysterious ethereal beauty. But the scene also further underlines her self-absorption. Her primary concern is her large collection of jewelry. But then disaster strikes. A huge fire burns up their jute plantation, and Phanibhushan tells Monimalika that they have run up a large debt. He has to rush back to Calcutta to secure some funds, while Monimalika chooses to stay behind in Malikpur. Monimalika wants to stay behind, because she is terrified that her husband will try to pay their debts by pawning her jewelry collection. So she decides to flee with all her jewels back to her own family up the river, and she summons Madhusudhan to take her there on a boat. When we see the unsavory Madhusudhan again, it becomes clear to the viewer that some sort of mayhem is going to happen to Monimalika on the way. Later when Phanibhushan returns from Calcutta with money and new jewels for his wife, he finds Monimalika missing and the mansion empty except for an elderly servant. We now move into the ghostly imagery of a haunted house. In the evening he keeps hearing footsteps in the hallway, and he thinks it is his beloved Monimalika returning. But it turns out to be a ghost instead. All of this part of the story is shot with expressionistic, spooky effects leading up to the final encounter between Phanibhushan and the bejeweled, skeletal ghost. When the narrator finishes his tale on the steps of the ghat, he looks over at his hooded listener, who has so far only been seen from behind. Now the figure stands up and says the narrator’s story contains some inaccuracies, and then he reveals himself to be Phanibhushan, himself. Then to the narrator’s astonished horror, the figure magically disappears, indicating that he, too, is a ghost. So the inner-narrative ghost story ultimately recoils back up to the outer narrative of the local schoolmaster. This Monihara segment has thinner characterizations than the other two, and its primary virtue is its atmospheric evocation of mystery. The final segment of Teen Kanya, Samapti, is the most light-hearted of the three offerings, and in this case it closes on a happier note. Again there is a young woman who baffles the man who is interested in her. 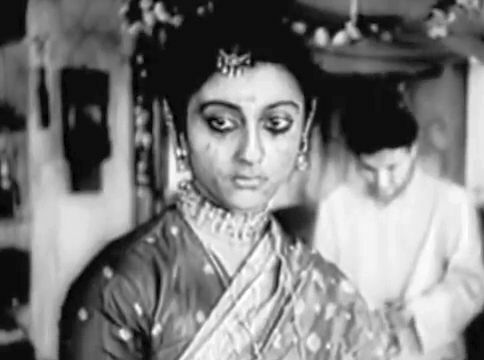 But the real feature of this segment is the magnetic characterizations of the two principals, thanks to the energetic performances of two young Indian movie stars – Soumitra Chatterjee (a Satyajit Ray favorite) and Aparna Sen (her debut performance at the age of 16). Also worth noting is the emotive performance of Sita Mukherjee, who plays the doting mother of Soumitra Chatterjee’s character. This story begins with Amulya (played by Soumitra Chatterjee), having successfully passed his college exams, returning by river boat to his home village to visit his widowed mother. When he gets off the boat, he slips and falls on the muddy shore, much to the mirthful delight of an onlooking tomboyish teenage girl, Mrinmoyee (Aparna Sen). Amulya takes note of the source of this giggling mockery before she runs away. Amulya’s mother, Jogmaya (Sita Mukherjee), is delighted to see her son, but she quickly tells him that it is now time for him to get married and that she has already chosen an auspicious wedding day and a girl from a “good family” (most important concerns for Indian arranged marriages). Amulya reluctantly but dutifully goes through the motions of formally meeting the family of the proposed girl and hearing about the shy and taciturn girl’s virtues. But the whole event is disrupted by the again onlooking and mischievous Mrinmoyee, who releases her pet squirrel into the room through the window, which causes chaos. Then she steals Amulya’s shoes that he had taken off and placed by the door upon entering the home of the proposed bride. All of this tomfoolery on the part of Mrinmoyee annoys, but tellingly, fascinates Amulya. He learns that she is an impish tomboy who plays all the time with the younger boys of the neighborhood and has acquired the nickname “Pagli” (crazy girl). The naughty, and pretty, girl captivates his heart. When he returns to his mother, he tells her that he is not interested in the proposed bride, but is interested in Mrinmoyee. Jogmaya is at first horrified, but she ultimate gives in to her beloved only son, and a wedding is duly arranged for Amulya and Mrinmoyee. Mrinmoyee is very reluctant to give up her gay, carefree life and take on the duties of being a wife, but she is unable to withstand family pressures. The wedding goes ahead. 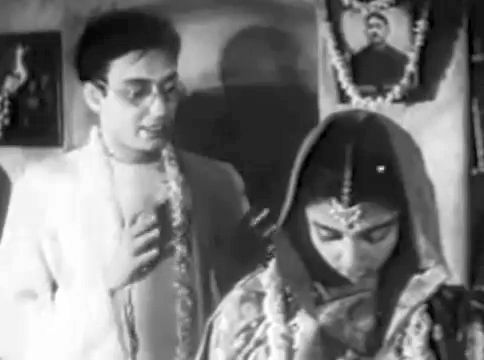 On their wedding night, though, Mrinmoyee tells Amulya that she was forced into the marriage and that she doesn’t want to get into bed with him. She still wants her freedom and doesn’t want to get locked into matrimonial restrictions. At this point the viewer’s sympathies are likely to lie with Mrinmoyee. Why should a teenage girl be coerced into a union not of her own choosing? After they argue and he dozes off, she sneaks out of his house by using her tree-climbing skills and goes out to spend the night swinging on her favorite swing hung from a tree. The image of a girl swinging on a swing seems to have held a special place for Tagore (and Ray), representing perhaps the joyous nature of free-spirited femininity. We see similar girl-on-a-swing imagery representing the same theme in Ray’s later Charulata (1964), which was also based on a tale by Tagore. In this story, though, the still rebellious Mrinmoyee is captured and locked in Amulya’s room. His relatives urge Amulya to be tough on the girl and exercise his manly rights, but Amulya is too civilized to do that. He tells Mrinmoyee that he is leaving her in the care of her mother and that he is going back to Calcutta. If and when she finally accepts him, he tells her, he will return to her. Mrinmoyee is now more or less a prisoner in her own home, and she takes to perpetually sulking. After six months of separation have passed, though, Jogmaya, missing her son and feeling something has to be done, summons him to return to their village on the pretext of her being ill. Amulya dutifully returns, and his mother convinces him to go to Mrinmoyee and inquire after her. The last few minutes of this segment are lyrical. Mrinmoyee is at first delighted to hear that Amulya has returned, but when she learns that the reason for his return is to see his supposedly ill mother, she frowns. Her feelings seem now to be torn. When Amulya comes to her home, he learns that she has run off into the woods. Now in the pouring rain, Amulya searches the woods for her, calling out her name. Still hiding in the brush, the pouting Mrinmoyee hears Amulya’s call and cannot suppress a smile. Soaked to the skin from the rain, Amulya finally gives up his search and returns to his room, where he discovers a note on his bed from “your Pagli”. Mrinmoyee has used her tree-climbing ability to sneak back into Amulya’s room. When he sees her, she smiles meekly and promises never to run away from him again. They have finally been united in true love. All three stories of Teen Kanya are about the captivating feminine element in male-female interaction. In the Tagore-Ray account of things here, the feminine alchemy is spontaneous and utterly unselfconscious, but there is something special about it. In The Postmaster, the relationship between the postmaster and the young chipmunk-like Ratan encompasses something more than just paternal/filial attachment. Nonsexual though their relationship is, it still involves the special magic that only the feminine presence can conjure. In Monihara, the feminine element becomes overtly supernatural, but, interestingly, this story is the least evocative of feminine mystery. In Samapti, the mystical feminine element is not only spontaneously projected, but also internalized – Mrinmoyee ultimately responds, herself, to her own feminine impulses. In all three stories, the male principal is helplessly captivated by an innocent girl, whose charm is guileless. She is not trying to seduce the man; she is just being her naturally enigmatic self. 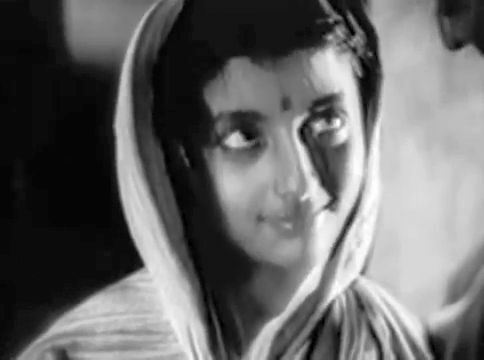 It took the brilliance and artistry of both Satyajit Ray and Rabindranath Tagore to capture the mystical and wonderful subtlety of these feelings and render them into the cinematic jewel that Teen Kanya is. Bosley Crowther, “Screen: India's Poetry by Satyajit Ray: He Echoes His Trilogy in 'Two Daughters'”, The New York Times, (1 May 1963). Marie Seton, Portrait of a Director: Satyajit Ray, (1971), Indiana University Press, pp. 160-4, 173-180. 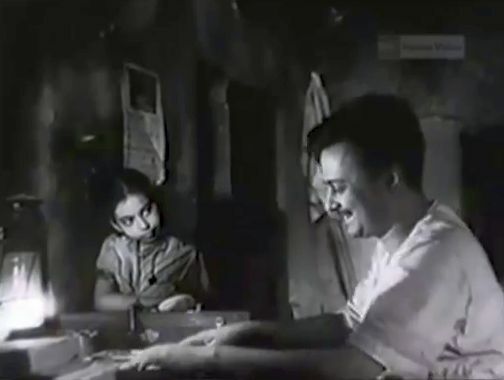 Pather Panchali (1955), Aparajito (1956), and The World of Apu (Apur Sansar, 1959). It is unclear what is Chandana Banerjee’s age in the film. The Wikipedia entry on her says she was born in 1953, making her only eight years old. But Marie Seton (see ref. , p. 175) says the girl was eleven years old, which looks about right to me. Rabindranath Tagore, “The Postmaster”, The Literature Network, (2015). Rabindranath Tagore, “The Postmaster”, The Project Gutenberg EBook of Stories from Tagore, by Rabindranath Tagore, (24 August 2010).